High-altitude trekking in mountainous regions calls for flexibility and adaptability to many conditions. In the wilderness, nature has the final say. For us to survive, we need flexibility and adaptability to circumstances as they unfold. While we endeavour to follow the itinerary below, we may need to change it to suit conditions. The end point will always be returning safely to our families. It is imperative to commit to pre-acclimatisation training beforehand to cope with the low oxygen environment that we will be visiting. During the trek, our blood oxygen will be monitored and your guide will advise you how to handle any issues that will inevitably crop up. With this in mind, we will have the best time on a trek that has unparalleled mountain views. The High Passes of Everest trek takes part entirely in Sagarmatha National Park (also known as the Khumbu or Everest region). The Sagarmatha National Park area is 1,148km2 and is the home of the famous Sherpa people, as well as the highest mountains in the world. We start our journey in Kathmandu, the capital of Nepal, which is full of historic temples and bursting with culture. A guided tour will be planned for those who wish to learn more about the city and religious sites. We then take a short flight to Lukla where the trek begins. Our trek takes us through the heart of the Khumbu region on some lesser travelled trails and over three high passes, all over 5,300m. We also climb three mountains at similar elevations – all with incredible views of the neighbouring peaks such as Everest, Lhotse, Makalu, Cho Oyu, and Ama Dablam. Other highlights include Gokyo Lake, a beautiful turquoise lake surrounded by glaciers, and Namche Bazar, the busy market town at the entrance to the Khumbu valley. We will also take a day trip to the famous Everest Base Camp where you can gaze up at Mt Everest and the Khumbu Ice Fall. This trek is not easy! It involves back-to-back days of trekking at high altitude, sometimes over rugged terrain. We expect all trekkers to have a high level of fitness so they can deal better with the altitude and the physically demanding nature of the trek. Our itinerary is tried and tested and includes multiple acclimatization and rest days along the way. However, we can’t predict how each team member will react to the altitude so we ask that all participants come well prepared for the demand of this trek (which means you need to train!). At The Altitude Gym, we will have a great opportunity to pre-acclimatize and all trekkers must commit to an agreed training program to make our collective journey a success. A very warm welcome to the Kingdom of Himalayas. Upon your arrival at the Tribhuvan International Airport our representative welcomes you and assists with your transfer to your hotel close to the airport. It’s a panoramic thrill flying into Lukla in a Twin Otter plane on a clear day. The views of snow-capped mountain peaks sprawling around you are almost ecstatic, beginning a whole chain of memorable experiences that will stay with you for a long, long time. This is an exciting flight which should give a glimpse of Everest in the distance. In Lukla, we will meet our trek staffs and porters and set off straightaway for our first night’s stop at Phakding, situated on the banks of the Dudh Kosi River, which drains the whole of the Khumbu Region. This small hamlet is on the main trade route through the area and there are a number of clean, well-built lodges where we can spend the night. We will continue up the banks of the Dudh Kosi River, crossing it twice by small suspension bridges before reaching the village of Monjo where we will enter the Sagarmatha National Park. We will then cross the confluence of the Dudh Kosi River and the Bhote Kosi River on the high suspension bridge and climb steeply for about 2 hours up “Namche Hill” to reach Namche Bazaar (3,440m). This is a prosperous trading town and the capital of the Khumbu region. Many Tibetans cross the nearby border to trade their wares and the local market is a fascinating spectacle. This is a good place to buy genuine Tibetan artefacts. Just across the valley to the east stand the peaks of Thamserku and Kangtega, both very impressive mountains. Namche Bazaar is the highlight of Everest Base Camp Trek and the heart of the Everest (Khumbu) region which has government offices, ATM’s, internet cafes, shops, restaurants, a bakery and a colourful market each Friday evening and Saturday. This is first scheduled ‘acclimatisation’ day for this trek. Health experts always recommend us to stay active and moving during the rest day instead of being idle. If we trek few hundred metres vertical during the day, it will help us to acclimatise with the unfamiliar heights that we are going to confront on the trek. Having been born, guiding and leading trips in the Himalayas, we believe in the natural process of acclimatisation – “Climb high, sleep low”. We take an interesting side trip up to Khumjung and climb up to the famous airstrip at Syangboche. Just above the airstrip is the Everest View Hotel (3,800m), a Japanese arrangement to build a deluxe hotel with great views of the highest mountains on earth. The Khumjung valley surrounded by the snow peaks of Kongde and Thamserku and the sacred peak the Khumbiyul-lha hosts a well-known monastery that houses a yeti scalp. Visit Hillary School which is at the same site and spending some time in Khumjung after having lunch, we walk back to Namche Bazaar. Thame is located west of the main Khumbu Valley. It is famous for being the birthplace of Tenzing Norgay, the first person to set foot on the summit of Mt. Everest with Edmund Hillary in 1953. We may meet Tibetans, who have crossed over the Nangpa La high passes from Tibet, coming down the valley to trade their goods in Namche Bazaar. We will take a leisurely walk towards Thame to further aid our acclimatization before continuing up the main trail. While walking through the woods to Thame, keep a lookout for the national bird of Nepal – the Impeyan pheasant. The walk to Thame is mostly flat and gently uphill climbs with superb views of many surrounding peaks. If time permits, we’ll pay a quick visit to the oldest monastery in the Khumbu valley at Thame. This is a relaxing place to take another essential acclimatization day tomorrow. We will not continue on yet as we have a large altitude gain to Lungden and we need our bodies to adjust further. Today we relax and enjoy our surroundings. There are particularly good views from here to Teng Kangpoche and Kwangde to the south and there is a gompa above the town, which we may take a stroll up to. Having left most trekkers behind, we will not find too many more until we arrive at Gokyo, as Thame tends to be the limit of exploration for groups coming up the valley. The high valley area remains the domain of yaks, farming and Sherpas, and today we walk by some very old and truly authentic Himalayan villages that blend almost invisibly into the landscape. We eventually reach the hamlet called Lungden. The ascent of the Renjo La is up a well-made, but rocky path, which the locals frequently cross with yaks. The climb is bound to feel tough as these altitudes, se we make an early start to give ourselves plenty of time, plus the best opportunity for the air to be clear when we reach the top of the pass. The views towards Everest to the east are some of the best that you can expect without having to get off a major trekking route. For the keen photographer, it is a much more open vista than you can expect on Kala Patthar or Gokyo Ri, so now is the time to get your camera out! Laid out before us is the stunning panorama of Everest, Cho Oyu, Gyanchung Kang, Makalu, Nuptse and Ama Dablam – virtually every mountain in the Khumbu and beyond. Having taken some time to enjoy these views, we begin the descent to Gokyo Lakes, down a fairly rough trail at first, before continuing steeply down a blunt ridge line to eventually reach more level ground. From here we skirt the north side of the Dudh Pokhari, travelling eastwards towards Gokyo and our lodge for the night. The earlier the better for the ascent of Gokyo Ri to catch the glimpse of the fresh morning sun, crowning some of the gigantic peak of the Himalaya. It takes between 2-3 hours of zig-zag our way to the summit of this famous vantage point. The summit boulders are draped with prayer flags and the views towards Cho Oyu are particularly good. We descent back down to Gokyo for breakfast, or if we have made a particularly early ascent, we will continue towards Dragnak. From Gokyo Resort the track climbs up gently towards the lateral moraine of the Ngozumpa glacier and then dead due east across the Ngozumpa Glacier. The Ngozumpa glacier, below the 6th highest mountain in the world Cho Oyu, stretching 36km is the longest glacier in the Himalayas. The route across the moraine of the glacier is on mostly sandy trails that weave amongst the ‘moonscape’ of the glacier, before reaching the small hamlet of Dragnak. This is a big day. We need to set off very early in the morning to ensure that we cross the Cho La and descent Dzongla in good time. At first we make a very gradual ascent alongside the river up a small valley to eventually reach a sandy ridge line, which gives a great view of the Cho La ahead and to the north east. There are some impressive 6,000m peaks to the viewed from here. To the north – the rocky Nirekha Peak and Kangshing Peak, and to the south the icy bulk of Cholatse. We make a long, gradual descent on a pleasant grassy path to reach the bottom of the pass. From this point the ground becomes more technical and it is time to pack away our trekking poles. The route weaves around boulders at first before climbing up onto rockier ground and a final steep section to reach the top of the pass. This is on loose ground, which can often be icy, so we need to take great care and it might be that we fix a short section of rope and use crampons especially if it is covered with snow and ice. Conditions on the pass can vary considerably, so we stick on the safe side and bring crampons with us just in case. The top of the pass is glaciated and we walk across a flat section of snow for about 15 minutes before dropping off the side and back onto rock. With Dzongla and the entire Everest valley now in sight, before we pick our way down the far side of the pass and descend into a lovely valley, we cherish this marvellous sight with our lunch and drink. A stream that meanders along the bottom leads us to the lodge at Dzongla and a well-deserved rest. This is a long day. After breakfast, an easy downhill towards east of the valley and turn left to get to Lobuche which is an easy walk where you will enjoy the views of different mountains and glacier. We will have lunch once we get to Lobuche and hike towards the Khumbu Glacier. The trail continues along the moraine affording you splendid views of Kala Patthar and Pumori. In the beginning we walk along the flat trial through yak pastures before we have to walk in glacier. The trail is rough and icy in some part. We arrive at Gorak Shep a tiny hamlet which used to be the site of the 1953 Everest expedition’s base camp. This morning, we set out to EBC. The trail is straight but steep, involving rocky dunes and moraine – the formed accumulation of unconsolidated glacial debris. On the way to our destination, we’ll approach the famed Khumbu Glacier and icefall, located on the slopes of Everest. At EBC, you’ll see where climbers call home during the spring climbing season. Break out your cameras for unbelievable views of breathtaking beauty. Before the afternoon sun starts to wane and the temperature plummets, we’ll head back to Gorak Shep for some much-needed rest and relaxation. We head off in the cold at 4am to trek up Kala Patthar (which means “Black Rock” in Hindi) under the light of our head-torch. The day’s first light will illuminate the most spectacular mountain panorama view of Everest and its neighbouring peaks – Himalayan giants all… Nuptse, Lhotse, Pumori, Changtse, Lingtren etc. Afterwards, it’s back down to Gorak Shep for breakfast and a quick rest before back tracking through the moraine and heading back to Lobuche to spend the night. After breakfast, we cross the third and highest pass, the Kongma La as we head towards Chukung. We will bring a packed lunch as there are no lodges on this pass. Following the trail that heads southeast, splitting from the main EBC trail, we gently hike to the lateral moraine of the Khumbu glacier. From the moraine, following the stone cairns, we walk across the Khumbu glacier to get to the opposite moraine. Do not miss the beautiful views of Pumori, Lingtren, Khumbutse, Cholatse and Taboche, while crossing the glacier. After getting to the other side of the glacier, we will scramble up the scree and icy boulder trail to Kongma La Pass. A cairn wrapped in prayer flag marks the pass. The view of Lhotse, Lhotse Shar, Makalu, Baruntse and Ama Dablam is simply dazzling against views of icy lakes and frozen ridges. From Kongma La, a steep descend over loose scree on a switch back trail will bring us to the beautiful lake at the bottom of the pass. From here, the trail enters a wide basin, scattered with tiny frozen lakes. From the basin, we will hike down a steep slope through the boulders. Now, ascending along the east side of the Niyang Khola Valley, we will continue to Langbo and over the outflow of Nuptse Glacier to Chukung. Chukung greets us with mind blowing views of Island Peak and Amphu Lapcha. After breakfast in Chukung, the journey continues south-west, towards Chubejung Kharka, where the trail gets back to the Everest Three Passes trekking trail, past Bibre. We will now continue to Dingboche following the trail along the Imja River. From Dingboche, the trail drops down the valley to Orsho, past a turn off to Pheriche. From Orsho, following the west bank of the Imja Khola, we hike down to Somare. About 20 minutes further downhill is a trail that leads to the beautiful monastery of Pangboche. We will visit the monastery and hike downhill to Deboche past Pangboche. Through the forest, we continue to Tengboche on a gently ascending trail. In Tengboche, we check into our lodge and spend the remaining time exploring the very beautiful Tengboche Monastery Complex and enjoying the beautiful panorama of Tawache, Everest, Nuptse, Lhotse, Ama Dablam and Thamserku. We will return to the lodge before nightfall. After breakfast, we set off for Namche. A steep descent through the forest of rhododendron takes us to the bridge across the Dudh Kosi leading to Phunki Tenga. We then we ascend on stone steps to Leushyasa and then another gradual hike to Sanasa, Chorkung and on to Namche. We can relax for the rest of the day at Namche, exploring the attractions around and enjoying the internet cafes, bakeries and restaurants. The trail now flattens out and we cross the river twice before rising traverse up the hillside past numerous tea houses to Lukla. Our last day of steady trekking will be a real joy as it is at lower altitudes and with two weeks behind us, and nothing left to prove, we can soak up the atmosphere in each of the villages we amble through. All excess energy is guaranteed to be exhausted at our party evening with our Nepalese crew. Saying final goodbyes to our porters, we fly back to Kathmandu after our long mountain journey. The flight time to Kathmandu are scheduled for the morning as Lukla experiences a lot of windy afternoons. Sometime the flight time can be delayed due to bad weather and other reasons. The early morning flight drops us at Kathmandu where we will be met and transferred to our hotel. You will have time to relax and have a long hot shower after the long journey. Remember, we will be hosting a fantastic celebration dinner together in the finest restaurant in Thamel in celebration of successfully completing your trip in the Himalayas. – Boudhanath Stupa with its 40m dome is one of the world’s largest Stupa and is generally acknowledged to be the most important Tibetan Buddhist monument outside of Tibet. – Pashupatinath Temple is considered one of the holiest shrines of all the Hindu Temples. The temple has remained the presiding deity of ruling Nepalese Royalty. – Swayambhunath 3km west of the city is one of the world’s most glorious Buddhist Stupas – it is said to be 2,000 years old. Visitors often call it the “Monkey Temple”. Today is free for last minute souvenirs and gifts shopping, and general exploration of the city. Today we will be transferred to the airport for our departure flight. Four nights’ hotel accommodation (3 Stars x 1 night; 4 Stars x 3 nights) in KTM including breakfast. Twin share basis. Single rooms at additional cost. Please inform us early if you wish to have a single room. One day sightseeing tour in and around KTM. Return domestic flight ticket KTM/Lukla/KTM in a twin otter plane. Please note: USD500 per person extra cost for chartering a private helicopter flight in case of bad weather disturbance on fixed wing twin otter flights. All pickup and drop off transportation from airports to airport. All clients are kindly requested to international travel together. Individual transfer charge is about USD20pp per trip. One locally made waterproof duffel bag will be provided for the trek. 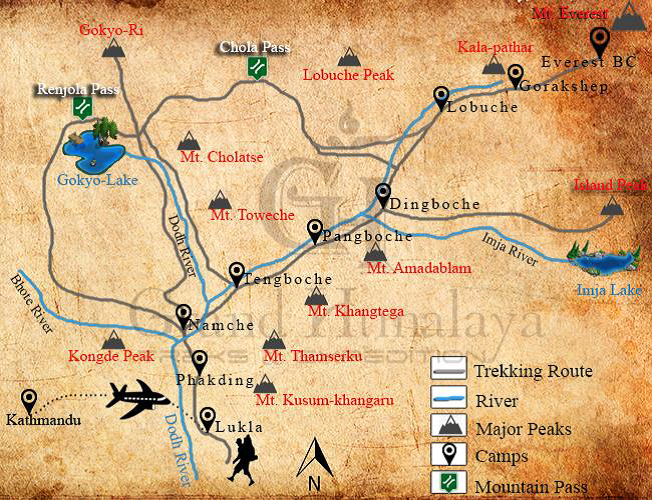 All lodging and meals during the trekking period. Breakfast, lunch, dinner, all hot drinks plus 2 litres of boiled water per person per day while on trek. One porter between two trekkers. Farewell dinner in KTM, local cultural music and dance show in a well reputed restaurant after trek. All local staff and porters insured and equipped. One bottle of Oxygen will be provided during the trek (for emergency medical use only). A comprehensive medical kit. All guests are requested to bring their own personal First Aid Kit with sufficient medication supplies for the trip. One regular cell phone with local SIM Card and charger cable will be provided for the team during the trip. Personal Travel Insurance – medical, helicopter rescue and repatriation is obligatory. Personal expenses e.g. phone calls, laundry, alcoholic beverages, mineral/bottled water, charges for showers, battery charging and wireless internet fee in tea houses. Main meals (lunch & dinner) in Kathmandu apart from celebration meal. Nepal Visa fees (USD40 available on entry and valid for 30 days) and two passport photos. Excess baggage above 15kg will be charged at USD15 per kg. Additional accommodation in KTM for early arrival, late departure or early return from mountain (due to any reason) than the scheduled itinerary. This package is for those who are unable to train at our gym but would like to only utilize our trekking services. You will be joining the team from The Altitude Gym in Kathmandu. High-altitude trekking gear are typically high-end in pricing too. We have spent thousands of dollars on gear and can take the guess-work out by recommending what’s necessary. Over-spending is unpleasant, but being under-equipped may be worse than an inconvenience. We will tell you what we recommend and can help you shop for every specific item that you need. We can help you with travel arrangements and provide recommendations on what to do afterwards so that you have a memorable all-round experience on the trip. All airport transfers to and from KTM will be organized for you. Depending on your arrival time, you will be greeted by us and / or our local guide who will then transport you to the hotel to join the team from The Altitude Gym and prepare for the trek ahead. From here on, we will be travelling and trekking together. As a team, we will help motivate each other through the challenging times and celebrate together afterwards. If you are new to high-altitude trekking but unable to train at The Altitude Gym, this may be right for you. You will need to have a positive frame of mind, be open to our recommendations and enthusiastic to train. We will need to agree on a training plan and keep in regular contact to ensure that your training is on track. The Three High Passes option in particular is much harder so we will discuss whether this option is suitable for you. No one can guarantee a successful high altitude trek, however, we will help minimize all the subjective errors so that you have the best chance of success. This all-inclusive package includes assessment of your fitness level, altitude gym membership, training, gear selection advice, travel advice, guiding and assisting you with everything necessary to complete your trek safely. High-altitude trekking gear are typically high-end in pricing too. We have spent thousands of dollars on gear and can take the guess-work out by recommending what’s necessary. Over-spending is unpleasant, but being under-equipped may be worse than an inconvenience. We will show you what we recommend and can help you shop for every specific item that you need. We can help you with travel arrangements and provide recommendations on what to do afterwards so that you have a memorable all-round experience on the trip. Our team in the gym, after all the training we’ve done together, will also now be travelling and trekking together. As a team, we’ll help motivate each other through the challenging times and celebrate together afterwards. If you are new to high-altitude trekking and can train at The Altitude Gym, this may be right for you. You will need to have a positive frame of mind, be open to our recommendations and enthusiastic to train. No one can guarantee a successful high altitude trek, however, we will help minimize all the subjective errors so that you have the best chance of success.